Vientiane, capital of Laos since 1975 always gives the impression of a colonial town with houses dating from the French time. Visit: Sisaket Museum, built in 1824, the only monastery that survived the destruction of 1828, The Ho Prakeo, the That Luang, the triumphal arch of Patuxai, markets (local, central). Continuation of the tour then transfer flight to Xiengkhouang. Visit the wonderfull Plain of Jars and Mouangkhoune, the former capital of Xiengkhouang. Visit local market early and departure to Luang Prabang by road. Stop at Sala Phoukhoun, an etnic Hmong village. Arrival in Luang Prabang the ancient capital of Laos, World Heritage Site by UNESCO in 1995. Visit the fresh food market and the main temples of Luang Prabang: Wat Xiengthong Monastery, WAT VISUNNARATH, WAT MAY and WAT SENE. Discovery tour of the National Museum (former Royal Palace), built in 1904 in a blend of traditional Lao and French classical style. Visit Ban Phanom (weaving village) and the village of Ban Sang Khong (papermaking). Short walk to Mount PHOUSY to watch the sunset over the Mekong and the view of the city of Luang Prabang. Excursion on a traditional Dugout canoe upstream Mekong to the PAK OU cave, a cave houding 4000 ancient statues of Buddha. Lunch in a restaurant in Ban Pak Ou. Visit Ban Sang Hai village specialized in distilling Lao whiskey (manufacture of spirits). Return to Luang Prabang. Minibus ride to the wonderfull waterfalls of Kwangsi. Swimming possible in a large blue lagoon at the foot of the fall. Massage and Sauna possible (optional). Free time for shopping until transfer to Luang Prabang airport for flight to Pakse. Welcome by your local guide on arrival in Pakse. 2 hours cruise on a traditional boat, to reach the former royal capital of Champasak. Discovery of fishermen's and their families life at the river banks. After breakfast, drive to Wat Phou (8 km from the city), a pre-Angkorian temple listed as a UNESCO World Heritage Site since 2002. The ruins date mainly from the X° and the XI° century, but the initial part dates back to the V° century and occupies an imposing site. Vat Phou was devoted to the worship of the Hindu god Shiva, the linga in its representation (or phallus). After the visit, a short walk to the water fall of Kohn Phapheng. 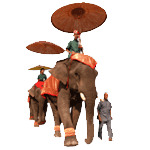 Arriving on the island of Khong in the late afternoon and transfert to your hotel. Visit of the island of Khong, to appreciate this peacfull life. After breakfast, ramble on the widest part of the Mekong, in the middle of the islands Si Phan Don (also called 4000 islands). Visit Donedet Donekhone and join the lifes of fishermen and farmers, ancounter remains of the French presence, the famous fresh water dolphins. Return by minibus to Pakse. Stroll around Pakse, between old colonial houses, the weaving village Ban Saphay and the local market. After breakfast, free time until transfer to airport for your return flight. As a guidance, the typical price for this Laos tour is $ 885, based on 4 people in standard accommodations.